Ensuring that your home is draft free is essential for energy efficiency. Energy Star estimates that replacing existing windows with energy efficient windows can save between 9-19% on energy bills. Switching to a high efficiency HVAC system can both save you hundreds a month on your gas and electric bill, and will make your home more comfortable for you and your family. Solar is best way to reduce your electricity cost by harnessing the power of the sun. Live a more comfortable life without having to worry about the price of electricity. 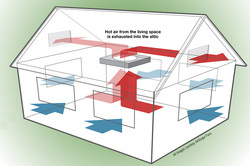 Whole House Ventilation can save up to 90% over the cost of running your air conditioner, even in warmer climates. We utilize Quiet Cool whole house fans to bring in the cool fresh air in ventilating your home. 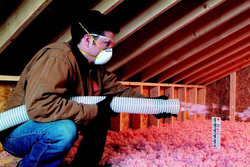 The amount of insulation determines the difference between the outdoors, and the warmth or coolness of your home. We aim to add a R-38 as a minimum barrier to your attic. Please inquire what that will do for your bill, and comfort. Artificial turf is a simple and easy way to replace your existing lawn into a water-saving and maintenance free landscape. Both aesthetically pleasing and energy efficient, switching to one of today's artificial grass alternatives is a no-brainer.